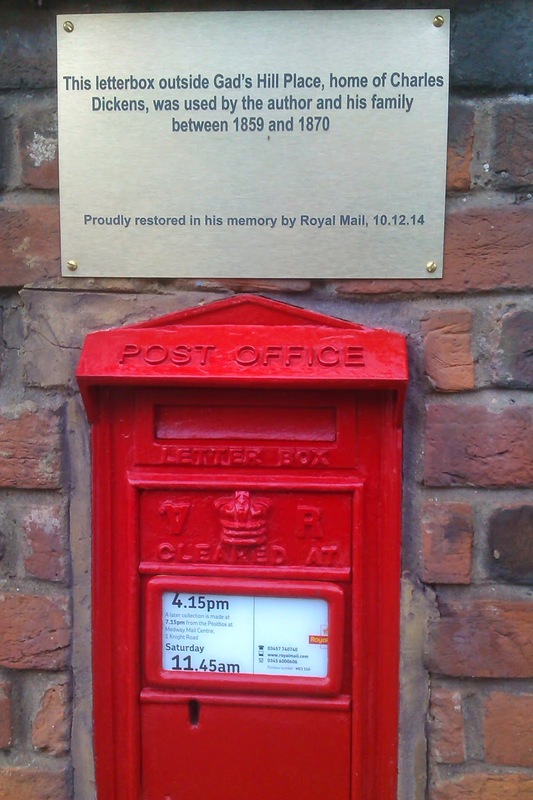 Charles Dickens’ postbox, installed by Royal Mail at the author’s request in the 19th century, has been recommissioned and put back into service following a special ceremony held today (Wednesday 10th December). 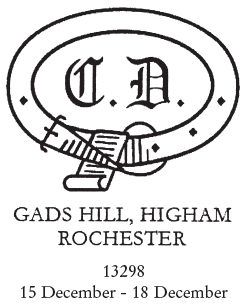 The postbox in Gads Hill, Higham, Kent, was officially reopened outside Dickens’ former home and now school, Gads Hill Place, by his great, great granddaughter, Marion Dickens. This letterbox outside Gad’s Hill Place, home of Charles Dickens, was used by the author and his family between 1859 and 1870. A special postmark will also be applied to mail posted in the box bearing the letters ‘CD’, in tribute to the way Dickens used to seal his mail before he posted it. The postmark will be applied from Monday 15th December to Thursday 18th December – the last recommended posting date for Second Class mail. I can't help thinking that the date should have been shown as 10.12.2014 (or even 10 December 2014). Unfortunately the press release does not identify whether this will be an operational slogan, or a special handstamp; or whether it will be applied to all mail posted in the area or only mail posted in the restored box. More details will be provided if we can winkle them out of Royal Mail. The special postmark is revealed to be a short-term handstamp in the latest Postmark Bulletin, and may be obtained from the London Special Handstamp Centre at Mount Pleasant, Ref 13298. What a lovely piece of Victorian workmanship that's lasted 125 years, compared to a very tacky plastic-looking plaque that I doubt will last 2 years. Would be nice if Royal Mail took care of some of their other postboxes too. There is a tatty box near my house that would actually "scrub up well" but instead of mending it RM just applied some red paint. So now it looks like a tatty old letter box painted but still without either an indicator saying when (if at all) letters are collected or when the next collection might be. A bit of solder to fix the left hand side of it would be all that is needed plus a good overhaul. It is impossible to complain as the only number one is given to call has an impossible voice recognition system that doesn't work. Any ideas on who could or how might I get this addressed? It may not be Dickens, but it would make the area look less tatty!